Triple Vinyl in Trifold Sleeve. US Edition! 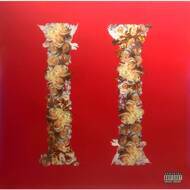 GRAMMY® Award-nominated multi-platinum hip hop trio Migos (Quavo, Offset, and Takeoff) return with their anxiously awaited full-length album, Culture II, almost exactly a year after the record breaking first installment. Lead single "Motorsport (feat Nicki Minaj & Cardi B)" is already topping charts, followed by the Pharrell produced smash, "Stir Fry".